I am excited to announce that we have kits. They were born about 2 1/2 hours ago. I’m not exactly sure how many she had. At least 8, maybe 10. Our first litter about 3 weeks ago died from the cold. So we moved this mama inside where it was warmer. She has been nesting for a week and I was really beginning to wonder. 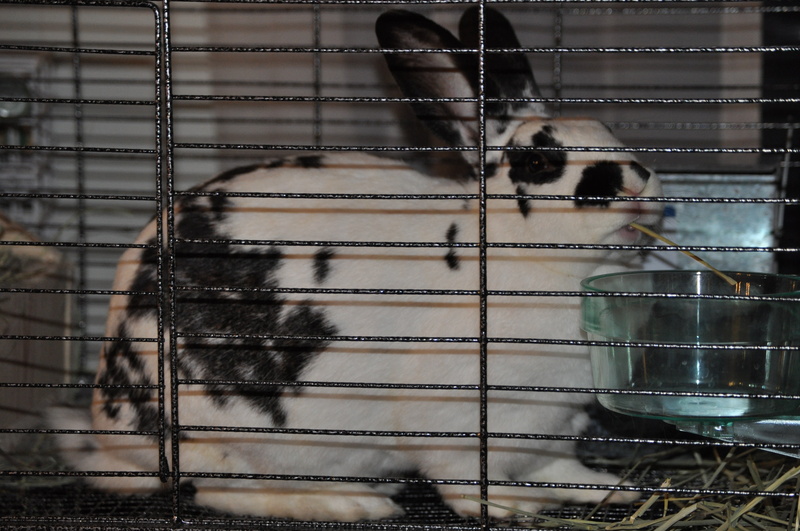 Last Monday she made a nest, then by Thursday she had messed it all up and eaten a lot of the hay. Then this past Friday she started pulling hair and rebuilt the nest. Then by yesterday she had messed it all up again. I didn’t know what was going on. Is she going to have babies or not? I watched her belly last night and saw some kicking so I was pretty sure we were having babies. But when? She’s been nesting off and on for over a week. In fact, I was going to post something this morning about these strange habits and how I can’t figure it out. But I got up late this morning, and had to hurry to get to work on time so I didn’t get around to it. Then around 5pm, honeyman came up stairs and told me there were babies. So far, they have lived longer than our first litter, so I feel the need to check on them often. There are 6 or so in a group all huddled up together, but then there are another 2-4 in other parts of the nesting box covered up with hay and mama’s hair. Should I worry about those? Should I move them so that they are all in the same huddle? Should I just leave them alone? I don’t know… I don’t want to mess with them if I don’t need to, but I don’t want them to die either. Looks like we have a good mixture of color here though — some dark, some white, and some black/white like their mother. The expectancy surrounding this for the past couple of days reminds me of when I was pregnant and anxiously awaiting the baby to arrive. Whew! Now if they can just live till tomorrow, I will feel a little more comfortable. 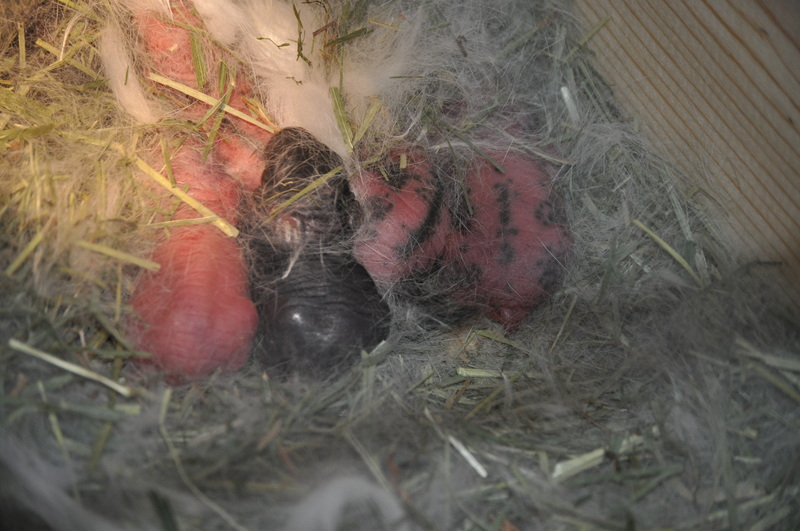 This entry was posted in Homesteading and tagged baby bunny, birth, bunnies, kit, litter, nesting, rabbits by monkeyneedle. Bookmark the permalink. Some things I don’t know yet… With your other litter, was it the rabbit’s first litter? Was it used to being outside in the cold? Had it ever had a winter litter before? Had it been moveto a new cage recently? These things can all effect the outcome of a litter freezing to death. A rabbit that is not used to it’s current conditions can screw up a lot and the babies can die of the cold in 70 degree weather. One that’s collected despite the conditions can keep babies alive in just about anything. I recently read about a litter of 10 alive in -12 degrees! The nest was built well and the babies were snug as a bug. In big litters the rabbits can often split into two piles. Check them regularly (2-3 times a day at most) and ask; Are there at least 3 in each pile? Are the piles both warm and insulated? Are all of the babies being fed? You can check on the litters without incident a lot of the time. You often find photos of day old kits because of this. Just keep them warm. It’s important, also to count them and make sure they’re ebing fed. If you’re worried about mom rejecting the kits, rub your hands with vanilla and some of mom’s litter (poo and fallen hay) and then dab some vanilla on mom’s nose and the kits. This way everything smells like vanilla for many hours and by the time it doesn’t mom doesn’t know you’re there. It also helps to remove mom from the cage for a moment. Put her in an excersize pen or some such. If you’re worried about keeping the kits warm, bring out a basket with a hot water bottle and a warm towel and in it and put the babies in this, being sure to cover them. It’s important to count your kits and handle them every day to check for dead kits and make sure they’re being fed. If one group isn’t being fed mom may need some encouragement to let them nurse or they need to stay together. Also, a dead kit can rot and kill the rest of the litter. The other litter was also a first for that mom. Both of these mothers are just 8-months old so it’s a first for both them and us. Both of the rabbits are used to being outside, but we have had some unseasonably cold weather here. We typically have 40-50 degrees days here this time of year, but the night the first litter was born it was 27 degrees. Not so cold from what I hear when it comes to having litters survive, but two days before that it was 75 degrees. So really, I think the rabbits might be confused. I was so upset when the others died, so I really want this litter to succeed which is why we brought her inside. It’s been 20 degrees outside for the last 5-6 days. Day after tomorrow is supposed to be 70 degrees again. I think we’re all confused. Sounds like I need to move some of the kits around so that there aren’t any by themselves. I guess this is a learning process for all of us and we’ll all (us and the mama bunnies) get better with practice. Thanks so much for the advice. And congratulations on your first litter as well! There is so much info out there! If you have a question, just look it up! Chances are someone has the answer. My own blog has the details of my own first month of ownership all layed out. (I keep meaning to make a summary post about all we learned. I will probably do that soon!) If it makes you feel any better about your lost litter, the average rate of first-time moms raising live litters is about 1 out of every three or four moms will have a succesful first litter. New moms just don’t know what they are doing, so it’s something to be expected. You only need to move the kits around if any are alone or not being fed. You can check just by body condition and heat. If they are warm and have round tummies they are being fed. If their tummies seem a little small, they are cold, or their mid-section is sunk-in they are not being fed. Also a lone kit has trouble staying warm but as long as there’s 1-2 others with it, it should be fine. My kits broke into groups like 3-4 times and they were fine without me doing anything.